Lima Memorial Health System president and CEO Mike Swick presents Jeff Fitzgerald, Rotary Foundation president, and Tracie Sanchez, Rotary president, with a check for $10,484 on Monday. 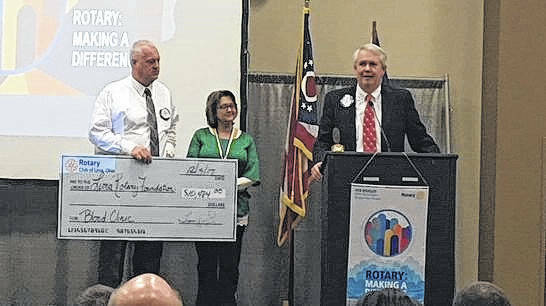 LIMA — A blood clinic helped raise $10,484 for the Lima Rotary Foundation. Mike Swick, president and CEO of Lima Memorial Health System, presented a check for $10,484 to the Lima Rotary Foundation at the club’s Monday afternoon meeting. The money was a result of a blood draw held by Lima Rotary on Nov. 4 at Senior Citizens Services, Inc.
“It’s a partnership between Lima Memorial and the Lima Rotary Club. Basically what we do is we (Lima Memorial) do the blood draws in conjunction with them, and the Rotary charges a flat fee and then we charge the Rotary our cost. The difference between our cost and what they get from the fee is what the $10,484 represents,” Swick said. There were 600 people in attendance at the Lima Rotary Blood Clinic that day. The Lima Rotary Club sponsors blood clinics twice a year, and those blood clinics are the club’s major fundraisers. “I think we have a great partnership going with Lima Memorial and the Rotary as it relates to what we can do for the community,” Swick said. “Part of it is the money, but a bigger part is we’re able to provide, at a very discounted rate, lab services for the people in the community that may not be able to afford to do it otherwise. So they’re getting their blood results that they may ordinarily not go get because they don’t have the insurance or something like that. The Lima Rotary Foundation will meet in January to decide how and where to disperse the money. “It will all go into our local community. Every penny of it stays local,” said Tracie Sanchez, president of the Lima Rotary Club.